It was at the age of 20, that Lorena Lohr left England to go to New York. From then on she begun a personal, photographic journey with the series ‘Ocean Sands‘. On her own, she travelled through Southwest America, wandering through deserted towns one after another. By trains, buses, and on foot she uncovered a remote number of states and their forgotten gems. 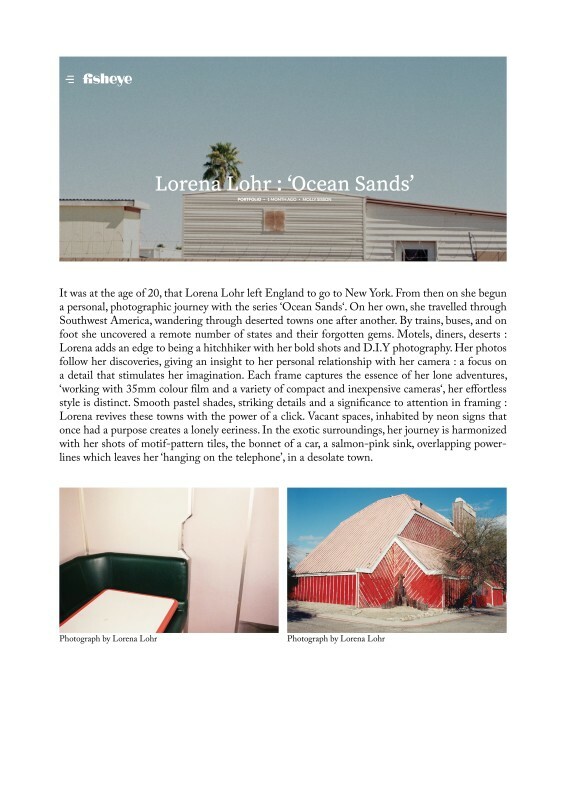 Motels, diners, deserts : Lorena adds an edge to being a hitchhiker with her bold shots and D.I.Y photography. Her photos follow her discoveries, giving an insight to her personal relationship with her camera : a focus on a detail that stimulates her imagination. Each frame captures the essence of her lone adventures, ‘working with 35mm colour film and a variety of compact and inexpensive cameras‘, her effortless style is distinct. Smooth pastel shades, striking details and a significance to attention in framing : Lorena revives these towns with the power of a click. Vacant spaces, inhabited by neon signs that once had a purpose creates a lonely eeriness. In the exotic surroundings, her journey is harmonized with her shots of motif-pattern tiles, the bonnet of a car, a salmon-pink sink, overlapping power-lines which leaves her ‘hanging on the telephone’, in a desolate town.